I am very excited to announce that I am going to be guest blogging for Camp Broadway! You may have seen my outfit for seeing Chaplin. Well, Camp Broadway saw it too! And now I'm a monthly blogger for them, focusing on what to wear when you go to the theater. Theater has always been a passion of mine. When I was younger, I danced, acted, and…attempted…to sing. While my calling is no longer being in the spotlight, I love to see a good show. In the past seven years, I’ve seen nearly 20 Broadway plays, ranging from Wicked to Hairspray and most recently (thanks to CB! ), Chaplin. As a New York City regular and frequent show-goer, I am going to theme outfits around particular plays and musicals. I absolutely love to get all dressed up, and seeing a show is one of the best times to do it! Why not take it a step further, and dress like you’re part of the show? Or dress according to a spin you take from the name of the play or one of its characters? One of the most popular Broadway plays showing right now is Peter and the Starcatcher. Winner of 5 Tony Awards, it is a spin off of the classic Peter Pan that we all knew and loved in our childhood. The play also gets inspiration from Peter and the Starcatchers, a wonderful book that takes you further into the depths of Neverland than the original story does. As a lover of both the new and old versions of Peter, I would love to be able to see Peter and the Starcatcher. And when I do (inevitably) see the play, this is what I'd wear! I sort of went along with the name "Starcatcher" in dressing in (double) star prints. What do you think? You can check out my post on Camp Broadway HERE! Awee, dressing like you're a part of a show, that is so super awesome! !~ and such a good idea... so much inspiration to draw from a show to put onto your outfit, I bet! I really love this whole outfit~ you're like a shooting star! That blouse is so pretty and I like how you've layered star print over star print like that. Love your bracelets and wearing both tops with star print are great. Pretty look! Simple and stylish! I love the star print on the cover up. So cute! awesome example of mixing simple prints, so cute! Lovely outfit! The star prints are awsome! I've never seen the star on star pattern thing you have going on! I really like how it looks- unexpected! Cute look! Loving your blouse and necklace! Congrats on your new guest post duties! Too cool doll! 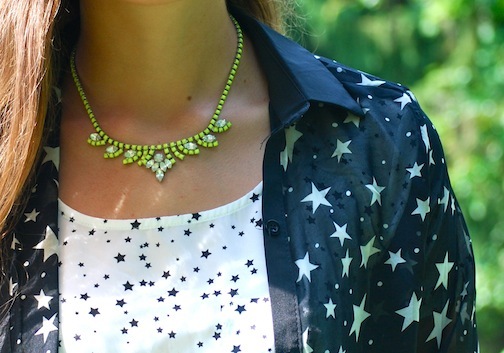 Love the mix of star prints and touch of neon! 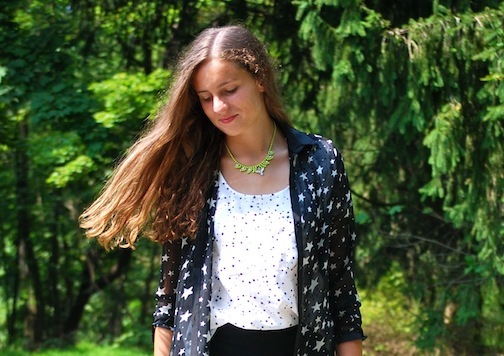 Loving the star prints mixed together - such a cute look! awww the star is so bright, you looks so fabulous! Love the star print on star print! Haven't seen that one yet! Aw I love the mix of stars! Join my Lady gaga Fame giveaway! I love the arm party going on!